2011 keeps getting better and better when it comes to great releases from all over the heavy world. And Greek scene does not make an exception. In the list of quality albums, such as Sun Of Nothing, Brotherhood Of Sleep, The Dive, Planet Of Zeus just to name few, I'm coming to add the debut album by the mighty 1000mods. 1000mods raised my expecations' bar high enough when they announced that Billy Anderson will be album's producer. And fortunately they managed to overreach them. 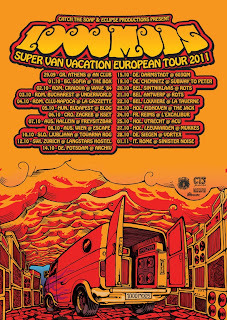 "Super Van Vacation" consists of 10 tracks with total duration of 65 mins (way longer from your typical stoner album). 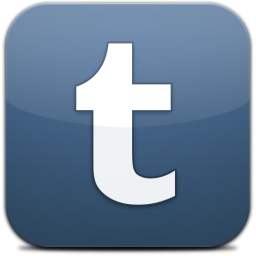 I have to say that before I hear it, I was a little bit concerned by its duration. You know I was thinking that maybe it'll be boring or get me tired etc. But from the first hearing, all my fears had gone away. Just like this. No the album doesn't have experiments or innovations. 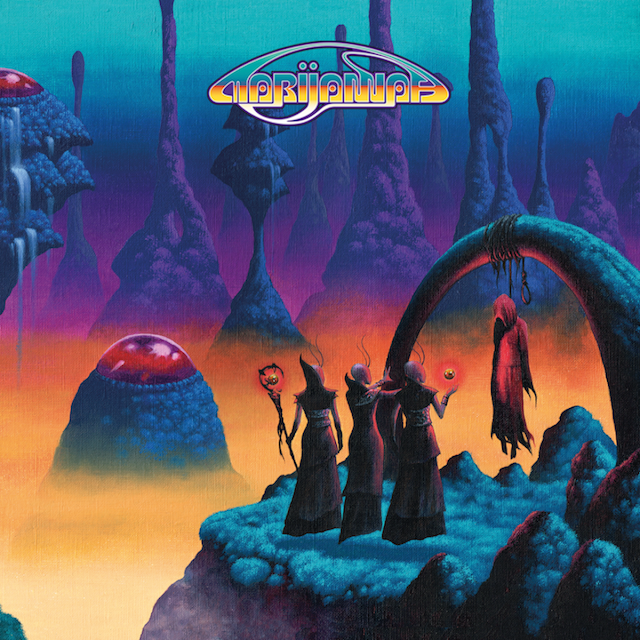 It's all about heavy, thick, full blast stoner rock injected with several psychedelic elements but without loosing its straightforward attitude. The production is excellent (I wasn't expecting something less than that). Billy balanced perfectly the sound by bringing Giannis' and George's guitars in the front line attacking you again and again with their solid, heavy riffs. Danis bass undertones and Labros drumming, come to amplify the heaviness by bringing up more power in your woofer than an earthquake. Danis' vocals stand out great and they're much better (it's called evolution through work) than they used to be. What I like in these guys is that they don't try to hide their influences. They follow the steps of Kyuss (let's be honest, which stoner / desert / sludge.... band doesn't) Monster Magnet, Dozer, Karma To Burn and they're really proud of it. Songs are permanently in full blast, even when they sound a little bit more "emotional" and "melodic" but while they're progressing it's time for Orange amps to start screaming. "Vidage" starting a little bit "emotional" as I said above (just listen to it and you'll catch the meaning) and it features some of Danis' best bass lines as well as the double-riffing kicking in after them in the song's second half. Definitely "Vidage" is one of the album's highlights! Sixth track is "Navy In Alice" which as the guys in Soda Shop stated is perfect for starting a mosh-pit in a gig. Then "Track Me" comes up, starting with a psych-like guitar and slowly escalating to a burst but always with a laid-back, chilling feeling. "Johnys" is a great slab of heavy, fuzz rock with a superb instrumental section. Album's last tracks "Abell" and the same titled "Super Van Vacation" are a grand finale and they'll surely make you press the repeat button for a lot of times. "Abell" I think is the most guitar-driven track of the record which really punches you in the face. 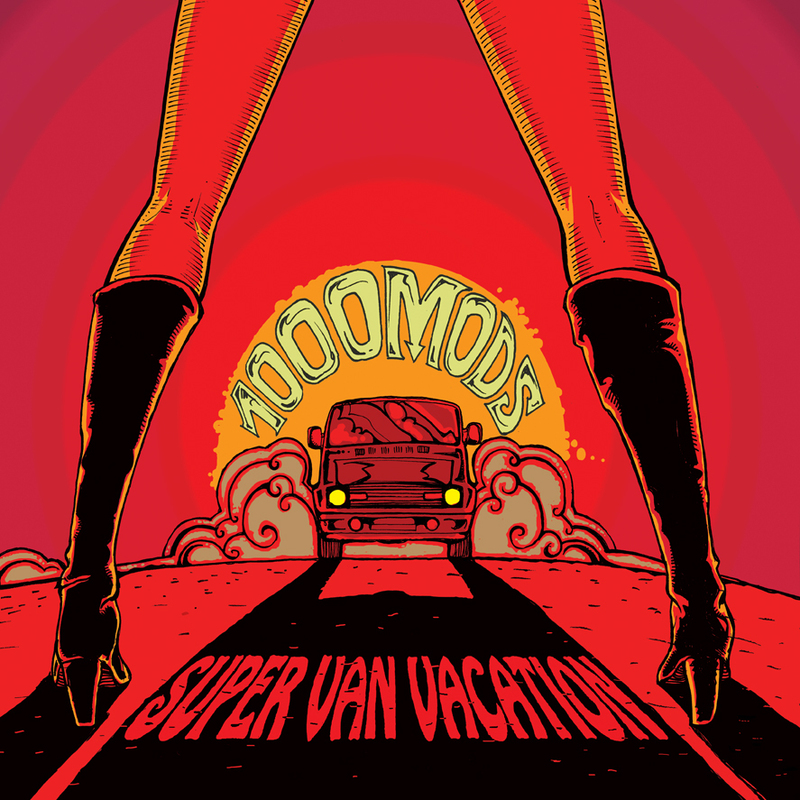 The first half of the last track ("Super Van Vacation") is a heavy, fast driven one, full of powerhouse riffing (with a pinch of blues' spirit in it) while the second half evolves into a heavy psych jam where they play like there is no tomorrow. Amazing! 1000mods play straight, furious stoner rock. Nothing more, nothing less. And they put their heart and soul in that. Their influences are present and obvious but they use them in a great manner, producing a record which really stands out and all you stoner-heads going to love. And I keep saying it (you know the influence stuff) because few people judged them about this in the past, like it was something really bad. Obviously they don't get it. Stoner (or desert or call it whatever you want) is all about feeling, passion and candidness. So when it comes to these terms, 1000mods are definitely winners. 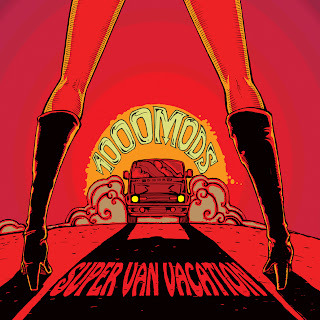 And "Super Van Vacation" is a killer straight-shooter album. So just get in the van! 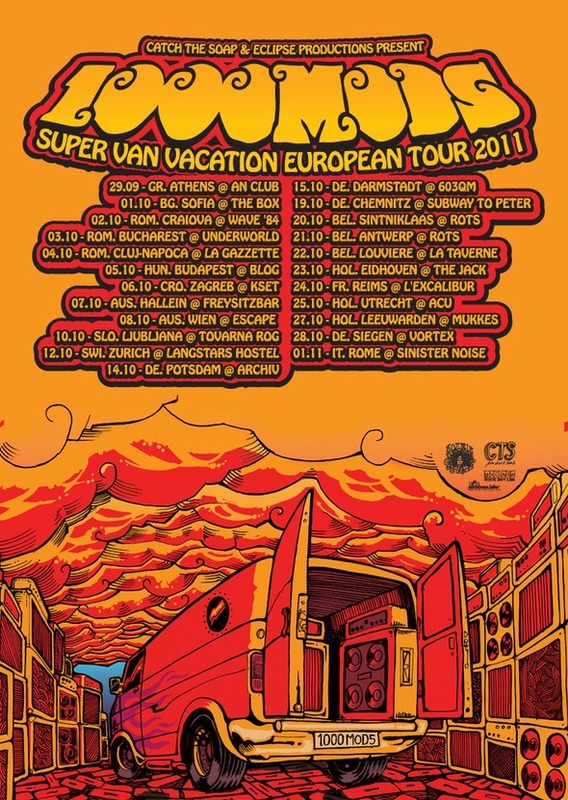 You can order "Super Van Vacation" through Kozmik Artifactz for the LP version or CTS Productions for the CD version. A 1000mods interview will be posted in the next couple of days, as well as an album's preview on Downtuned Radio's "Stone The Show" this Wednesday. So stay tuned! 1000mods will tour Europe in October. For more info about the dates check tour's Facebook page or our upcoming lives section.